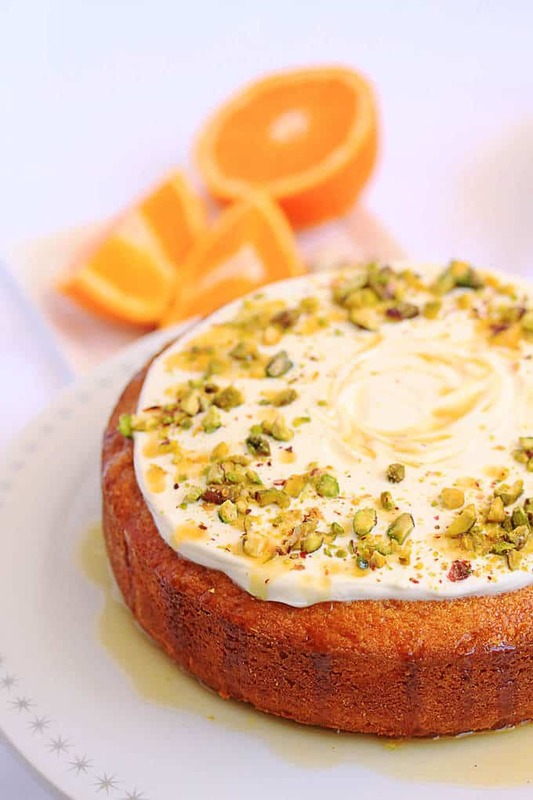 Zesty and fresh, Orange Semolina Cake topped off with natural greek yoghurt and pistachios for crunch. We found this lovely little café right by the beach. Coffee (or 2) downed, and breakfast devoured, we paid our bill and, walking past the cake display, I saw a pretty looking orangey cake with some cream or yoghurt on top and dotted with pistachios. 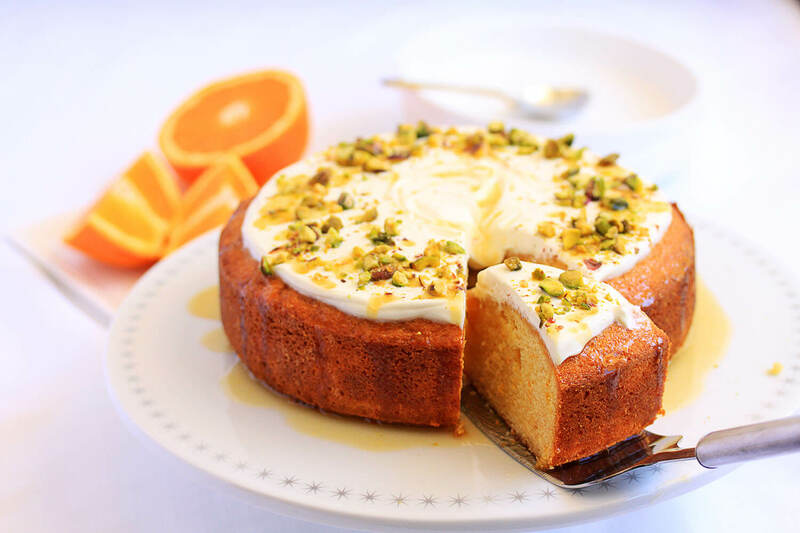 It didn’t have a label to say what it was, so I decided that it was an Orange Semolina Cake topped with Yoghurt and Pistachios so that’s what I made. It looked orangey and semolina-y, if that’s a thing and the rest just seemed to fit perfectly. A large portion of the trip home was spent researching and working out how I was going to create this beauty along with deciding on the other recipes I wanted to make on the day off I had planned the very next day. 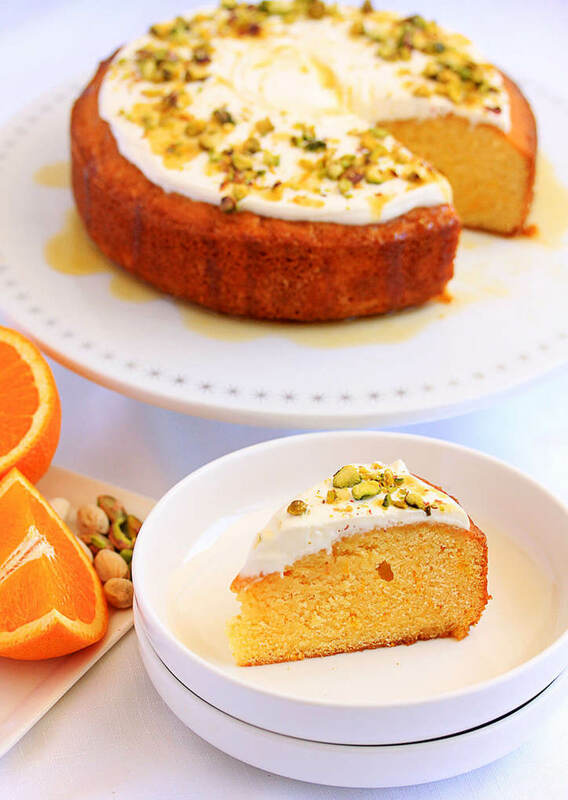 So Orange Semolina Cake is a pretty simple cake to bake. 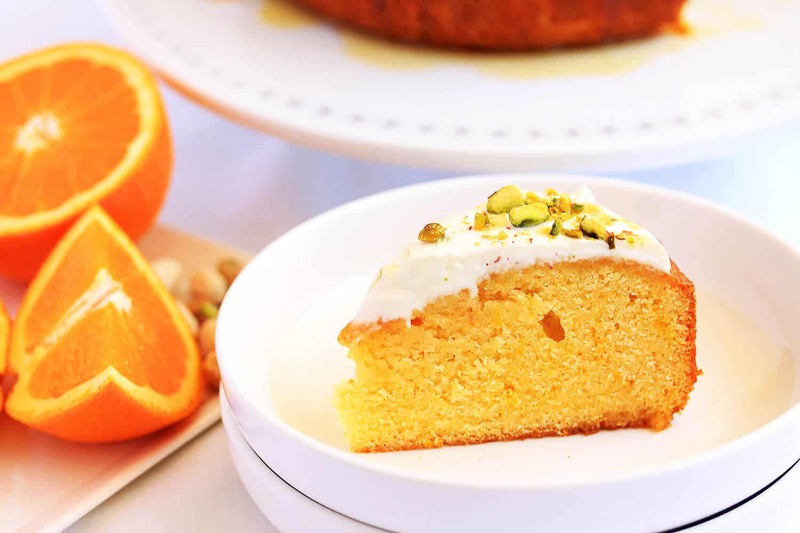 It gets it’s orange flavour from the zest and juice of 2 oranges plus a little extra to make a sweet, orange syrup to pour all over it at the end. It’s perfect with a cuppa in the afternoon. Using yoghurt to top it instead of cream or frosting makes it taste so much lighter. Make sure, as with most cake baking, all of your ingredients are at room temperature. Make sure to beat the butter and sugar really well and then each of the eggs really well to get lots of air into the batter. To make the cake, in the bowl of a stand mixer, beat together the butter and caster sugar until very light and fluffy. Scrape down the sides of the bowl as required. While this is happening, sift together your flour, semolina, baking powder and salt and mix well. Add the eggs one at a time to the butter and sugar mix. Beat thoroughly and scrape down the bowl after each addition. Add the vanilla and orange zest and give one final mix. Using a spatula, gently fold in half the flour mixture until just combined. Add the orange juice and fold through gently, then the final half of the flour. Pour the mixture into your prepared tin and bake for 40-45 minutes until a toothpick comes out with just a couple of crumbs. After about 5 minutes remove from the tin and allow to cool completely on a cooling rack. To make the syrup pour the water and sugar into small saucepan and mix gently until the sugar has dissolved. Bring to a simmer until reduced by half. Reserve 2 teaspoons of the syrup and once the cake has cooled, drizzle over the rest of the syrup and make sure it runs down the sides a little. You can even poke a few holes into the cake so the syrup can make its way through the cake too. Try not to let it pool all in the centre if you have a dip in the cake though. 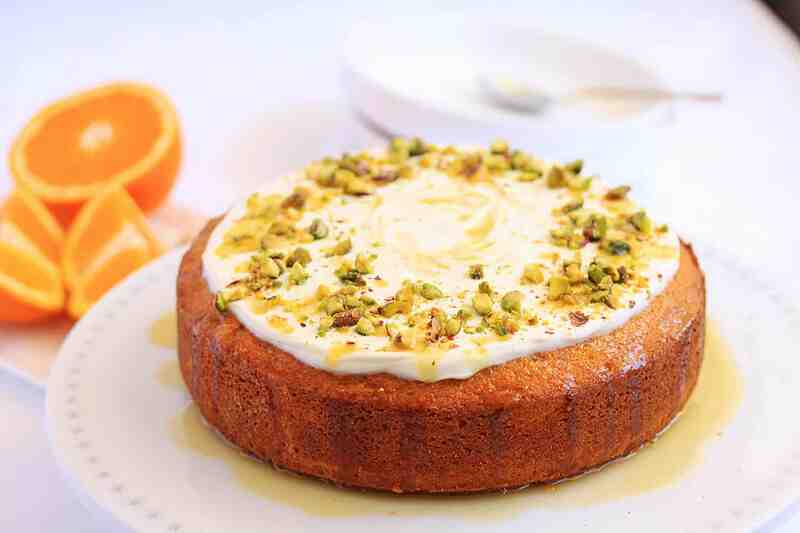 Top with yoghurt and pistachios and drip the reserved syrup over the top.